I know - this is just another 'minor media scam' of the sort most Cluesforum readers probably won't care much about... but nonetheless, since I live in Italy (and this media story involves "Italian victims"), I'll share my musings about it with you all - since I honestly still wonder myself about the full meaning / purpose / scope of these 'minor' media PsyOps being thrown at us on a regular basis. 56 students of 22 different nationalities were travelling on a bus directed to Valencia (Spain) - to experience the world-famous Fallas fireworks festival (which I have personally enjoyed some years ago - pretty awesome, I can tell you!) - which then dramatically crashes at the 333km-mark of the Valencia-Barcelona highway. By most 'accounts' (i.e. news media reports), the reason for the crash is that the bus driver fell asleep (yet, early "survivor accounts" are in stark conflict with that version). Anyhow, the bus apparently flips on its side and lands on the opposite highway-lane - and then another vehicle smashes into it ("causing most of the casualties"). Now, let me translate what "Survivor Girl" has to say. She's featured in the below-linked video (being interviewed in her wheelchair). Here's my integral translation of that brief & bizarre interview of Survivor-Girl ("SG") by some media reporter ("MR") . SG: "...behind the bus driver..."
MR: "You practically ended up on top of him?..." SG: "Yes, I practically ... threw myself against him...eh! ... but then again there are guys ['ragazzi'] who are worse off than myself - and now they are inside [???] ... but we... well, luck was on our side... molto!" MR: "Listen, did the bus driver distract himself, by any chance?" SG: "No, the bus driver wasn't... he was distracted for a second as he raised a tiny bit the volume of the music [i.e. of the hi-fi system of the bus] ... but... it wasn't... I mean it wasn't such an enormous distraction as to have caused this damage... Undoubtedly, the blame should be placed on the driver [of the vehicle] in front of us who braked... without activating the turn signals..."
Needless to say, Survivor-Girl's story stinks to high heaven. It makes absolutely no sense at all. If a firsthand-witness like "Survivor-Girl" says that the driver was wide-awake (and was pumping up the volume of the radio) - why is ALL of the Italian media rambling on about "the bus driver falling asleep - and that we now ought to legislate to install sleep-alarms in all public transport vehicles?" So why, why - I ask you - do they keep staging these inane, 'minor' media PsyOps all over the world? If you, The Shack, are studying it, it must be newsworthy. Or, if a brutally honest appraisal compels one to conclude the subject is indeed minor, then it must be art. Either way, "newsworthy" or "art", you're good to go. My thoughts exactly. I too fell in love several times while investigating this incident. It's plain unfair, as well as being a clear case of media fakery. I see SimonShack's point and I found it in scope, if I may say so. media fakery might not regard just the fact itself, or better the alleged fact and its reconstruction; this part can be altered or modified as we perceive reality through a mass media anyway (if any cluesforum user was there and can give a first hand account then be welcome, take a seat and tell us) and so who controls mass media can change the representation we perceive as reality. Then there is another level, related to the symbolic meaning of an event. At that level those who can alter the media representation take great care in supplying the correct numbers (according to the symbolic meaning of numbers used mostly by freemasonry but with roots in kabbalah and representation in tarots) hence the recurring 7, 8, 9, 11, 13, 22, 33. - one at a more general level to state in an indisputable way either "we did it" or "we had our hand on it". So the fact itself may have really happened - I can't say if the victims are instead vicsims - with actual casualties but once they decide it has to be perceived as happened, it comes the symbolic part. In this case I wonder if the message is related to the Erasmus project (is it under discussion ? Did anyone question the fact that they were coming from a local festive situation and not from an academic-related event ? ), the safety of transportation (as already pointed out), the autonomy of Catalunya or the safety of their roads, Italy-Spain relationship... ? I can just say that as we (almost) all understood the regular appearance of some numbers is not at all by chance. It means that there are powers who want to show through the media they either originated or controlled or handled the situation in some ways. simonshack wrote: I don't know about you, dear reader - but as far as I'm concerned, you may truly be forgiven for suspecting that modeling agencies are involved with / and contracted for these lame, recurring media PsyOps. I agree the pictures from certain events have a model agency feel to them, and it makes perfect sense to use such material. But I don´t agree a busload of students in their twenties is unlikely to include seven delightfully attractive girls using every beauty device money can buy. Imagine a fatal accident involving an average class of Brazilian medical students! This is not to attack you personally flabbergasted, but seriously your post doesn't make sense at all. You call this "an average class of Brazilian medical students"? I thought Brazil was about 75% blacks, and what they call multi-racial. The students in these pictures are majority white. I see one Asian. Blacks aren't supposed to be such students? Or maybe they deserve to be beaten like in this video? JLapage wrote: This is not to attack you personally flabbergasted, but seriously your post doesn't make sense at all. I was talking about beauty being a common asset among twenty-three-old college students. In other words, the likelihood of seeing 7 very attractive girls on a bus carrying university students is not "astronomically remote" by any account. JLapage wrote: You call this "an average class of Brazilian medical students"? JLapage wrote: I thought Brazil was about 75% blacks and what they call multi-racial. A misconception. You cannot apply conventional notions of racial type to the Brazilian population. What looks "white" to you at first glance is actually often mixed race (whatever that means). JLapage wrote: Blacks aren't supposed to be such students? simonshack wrote: So why, why - I ask you - do they keep staging these inane, 'minor' media PsyOps all over the world? The way I see it, it's in order to induce compassion fatigue. This reminds me of a bus accident in Sierre, Switzerland, on March 13, 2012. There were 28 victims, 22 of which were Belgian children on holiday. The bus driver had apparently accelerated before hitting a wall in a tunnel. One possible explanation is suicide, just like Germanwings Flight 9525. Like the pilot, the bus driver was on antidepressants. I haven't investigated, but obviously it could be a psyop. At the time it was a huge shock, at least for the Flemish speaking part of the country. During this month of march there were many articles and events that brought this event back into memory. 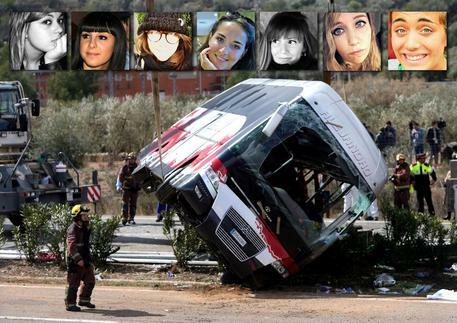 2 of the students on the bus in Valencia were from Belgium, they both survived. I have no pictures of them, sorry.